After baking so much, I feel like I’m not eating very healthy. I put so much focus on what kind of sweets I’m going to bake, but what about for meals? Recently, I decided to take a stab at cooking. I started off easy. I bought Martha Stewart’s Everyday Food books for fast, easy, and not to mention delicious meals. I flipped through the book and this meal was calling me. I love chicken. It’s my favorite kind of meat to have for a meal. If I were to eat out, I would most likely pick some kind of chicken dish. Why not? They’re one of the most efficient kinds of protein meat and they taste oh so yummy. 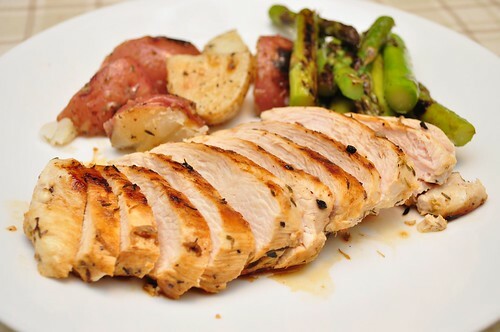 This entry was posted in Chicken, Recipes and tagged asparagus, chicken, food, garlic, meals, potatoes, recipes, thyme on March 23, 2011 by Krystal.